JESUS seeing the multitudes, went up into a mountain: and when he was set, his disciples came unto him: and he opened his mouth, and taught them, saying, Blessed are the poor in spirit: for their's is the kingdom of heaven. Blessed are they that mourn: for they shall be comforted. Blessed are the meek: for they shall inherit the earth. Blessed are they which do hunger and thirst after righteousness: for they shall be filled. Blessed are the merciful: for they shall obtain mercy. Blessed are the pure in heart: for they shall see God. Blessed are the peace-makers: for they shall be called the children of God. Blessed are they which are persecuted for righteousness' sake: for their's is the kingdom of heaven. Blessed are ye, when men shall revile you, and persecute you, and shall say all manner of evil against you falsely, for my sake. Rejoice, and be exceeding glad: for great is your reward in heaven: for so persecuted they the prophets which were before you. "And Jesus seeing the multitudes went up into the mountain, and when He was set, His disciples came unto Him. And He opened His mouth, and taught them saying, Blessed," etc. See how unambitious He was, and void of boasting: in that He did not lead people about with Him, but whereas, when healing was required, He had Himself gone about everywhere, visiting both towns and country places; now when the multitude is become very great, He sits in one spot: and that not in the midst of any city or forum, but on a mountain and in a wilderness; instructing us to do nothing for display, and to separate ourselves from the tumults of ordinary life, and this most especially, when we are to study wisdom, and to discourse of things needful to be done. But when He had gone up into the mount, and "was set down, His disciples came unto Him." Seest thou their growth in virtue? and how in a moment they became better men? Since the multitude were but gazers on the miracles, but these from that hour desired also to hear some great and high thing. And indeed this it was set Him on His teaching, and made Him begin this discourse. For it was not men's bodies only that He was healing, but He was also amending their souls; and again from the care of these He would pass to attendance on the other. 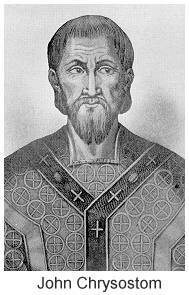 Thus He at once varied the succor that He gave, and likewise mingled with the instruction afforded by His words, the manifestation of His glory from His works; and besides, He stopped the shameless mouths of the heretics, signifying by this His care of both parts of our being, that He Himself is the Maker of the whole creation. Therefore also on each nature He bestowed abundant providence, now amending the one, now the other. And in this way He was then employed. For it is said, that "He opened His mouth, and taught them." And wherefore is the clause added, "He opened His mouth"? To inform thee that in His very silence He gave instruction, and not when He spoke only: but at one time by "opening His mouth," at another uttering His voice by the works which He did. But when thou hearest that He taught them, do not think of Him as discoursing with His disciples only, but rather with all through them. For since the multitude was such as a multitude ever is, and consisted moreover of such as creep on the ground, He withdraws the choir of His disciples, and makes His discourse unto them: in His conversation with them providing that the rest also, who were yet very far from the level of His sayings, might find His lesson of self-denial no longer grievous unto them. Of which indeed both Luke gave intimation, when he said, that He directed His words unto them: and Matthew too, clearly declaring the same, wrote, "His disciples came unto Him, and He taught them." For thus the others also were sure to be more eagerly attentive to Him, than they would have been, had He addressed Himself unto all. 2. Whence then doth He begin? and what kind of foundations of His new polity doth He lay for us? Let us hearken with strict attention unto what is said. For though it was spoken unto them, it was written for the sake also of all men afterwards. And accordingly on this account, though He had His disciples in His mind in His public preaching, yet unto them He limits not His sayings, but applies all His words of blessing without restriction. Thus He said not, "Blessed are ye, if ye become poor," but "Blessed are the poor." And I may add that even if He had spoken of them, the advice would still be common to all. For so, when He saith, "Lo! I am with you always, even unto the end of the world," He is discoursing not with them only, but also, through them, with all the world. And in pronouncing them blessed, who are persecuted, and chased, and suffer all intolerable things; not for them only, but also for all who arrive at the same excellency, He weaves His crown. However, that this may be yet plainer, and to inform thee that thou hast great interest in His sayings, and so indeed hath all mankind, if any choose to give heed; hear how He begins these wondrous words. "Blessed are the poor in spirit; for theirs is the kingdom of Heaven." What is meant by "the poor in spirit?" The humble and contrite in mind. For by "spirit" He hath here designated the soul, and the faculty of choice. That is, since many are humble not willingly, but compelled by stress of circumstances; letting these pass (for this were no matter of praise), He blesses them first, who by choice humble and contract themselves. But why said he not, "the humble," but rather "the poor?" Because this is more than that. For He means here them who are awestruck, and tremble at the commandments of God. Whom also by His prophet Isaiah God earnestly accepting said, "To whom will I look, but to him who is meek and quiet, and trembleth at My words? "For indeed there are many kinds of humility: one is humble in his own measure, another with all excess of lowliness. It is this last lowliness of mind which that blessed prophet commends, picturing to us the temper that is not merely subdued, but utterly broken, when he saith, "The sacrifice for God is a contrite spirit, a contrite and an humble heart God will not despise. "And the Three Children also offer this unto God as a great sacrifice, saying, "Nevertheless, in a contrite soul, and in a spirit of lowliness, may we be accepted." This Christ also now blesses. 3. For whereas the greatest of evils, and those which make havoc of the whole world, had their entering in from pride:-for both the devil, not being such before, did thus become a devil; as indeed Paul plainly declared, saying, "Lest being lifted up with pride, he fall into the condemnation of the devil: and the first man, too, puffed up by the devil with these hopes, was made an example of, and became mortal (for expecting to become a god, he lost even what he had; and God also upbraiding him with this, and mocking his folly, said, "Behold, Adam is become as one of us" ; and each one of those that came after did hereby wreck himself in impiety, fancying some equality with God:-since, I say, this was the stronghold of our evils, and the root and fountain of all wickedness, He, preparing a remedy suitable to the disease, laid this law first as a strong and safe foundation. For this being fixed as a base, the builder in security lays on it all the rest. But if this be taken away, though a man reach to the Heavens in his course of life, it is all easily undermined, and issues in a grievous end. Though fasting, prayer, almsgiving, temperance, any other good thing whatever, be gathered together in thee; without humility all fall away and perish. It was this very thing that took place in the instance of the Pharisee. For even after he had arrived at the very summit, he "went down" with the loss of all, because he had not the mother of virtues: for as pride is the fountain of all wickedness, so is humility the principle of all self-command. Wherefore also He begins with this, pulling up boasting by the very root out of the soul of His hearers. And what," one may ask, "is this to His disciples, who were on every account humble? For in truth they had nothing to be proud of, being fishermen, poor, ignoble, and illiterate." Even though these things concerned not His disciples, yet surely they concerned such as were then present, and such as were hereafter to receive the disciples, lest they should on this account despise them. But it were truer to say that they did also concern His disciples. For even if not then, yet by and by they were sure to require this help, after their signs and wonders, and their honor from the world, and their confidence towards God. For neither wealth, nor power, nor royalty itself, had so much power to exalt men, as the things which they possessed in all fullness. And besides, it was natural that even before the signs they might be lifted up, at that very time when they saw the multitude, and all that audience surrounding their Master; they might feel some human weakness. Wherefore He at once represses their pride. And He doth not introduce what He saith by way of advice or of commandments, but by way of blessing, so making His word less burthensome, and opening to all the course of His discipline. For He said not, "This or that person," but "they who do so, are all of them blessed." So that though thou be a slave, a beggar, in poverty, a stranger, unlearned, there is nothing to hinder thee from being blessed, if thou emulate this virtue. "Blessed are they that mourn." Yet surely all men call them miserable. For therefore He wrought the miracles beforehand, that in such enactments as these He might be entitled to credit. And here too again he designated not simply all that mourn, but all that do so for sins: since surely that other kind of mourning is forbidden, and that earnestly, which relates to anything of this life. This Paul also clearly declared, when he said, "The sorrow of the world worketh death, but godly sorrow worketh repentance unto salvation, not to be repented of." These then He too Himself calls blessed, whose sorrow is of that kind; yet not simply them that sorrow did He designate, but them that sorrow intensely. Therefore He did not say, "they that sorrow," but "they that mourn." For this commandment again is fitted to teach us entire self-control. For if those who grieve for children, or wife, or any other relation gone from them, have no fondness for gain or pleasure during that period of their sorrow; if they aim not at glory, are not provoked by insults, nor led captive by envy, nor beset by any other passion, their grief alone wholly possessing them; much more will they who mourn for their own sins, as they ought to mourn, show forth a self-denial greater than this. Next, what is the reward for these? "For they shall be comforted," saith He. Where shall they be comforted! tell me. Both here and there. For since the thing enjoined was exceeding burthensome and galling, He promised to give that, which most of all made it light. Wherefore, if thou wilt be comforted, mourn: and think not this a dark saying. For when God doth comfort, though sorrows come upon thee by thousands like snow-flakes, thou wilt be above them all. Since in truth, as the returns which God gives are always far greater than our labors; so He hath wrought in this case, declaring them that mourn to be blessed, not after the value of what they do, but after His own love towards man. For they that mourn, mourn for misdoings, and to such it is enough to enjoy forgiveness, and obtain wherewith to answer for themselves. But forasmuch as He is full of love towards man, He doth not limit His recompense either to the removal of our punishments, or to the deliverance from our sins, but He makes them even blessed, and imparts to them abundant consolation. But He bids us mourn, not only for our own, but also for other men's misdoings. And of this temper were the souls of the saints: such was that of Moses, of Paul, of David; yea, all these many times mourned for evils not their own. 5. "Blessed are the meek, for they shall inherit the earth." Tell me, what kind of earth? Some say a figurative earth, but it is not this, for nowhere in Scripture do we find any mention of an earth that is merely figurative. But what can the saying mean? He holds out a sensible prize; even as Paul also doth, in that when he had said, "Honor thy father and thy mother," he added, "For so shalt thou live long upon the earth." And He Himself unto the thief again, "Today shalt thou be with me in Paradise." Thus He doth not incite us by means of the future blessings only, but of the present also, for the sake of the grosser sort of His hearers, and such as before the future seek those others. Thus, for example, further on also He said, "Agree with thine adversary." Then He appoints the reward of such self-command, and saith, "Lest at any time the adversary deliver thee to the judge, and the judge to the officer." Seest thou whereby He alarmed us? By the things of sense, by what happens before our eyes. And again, "Whosoever shall say to his brother, Raca, shall be in danger of the council." And Paul too sets forth sensible rewards at great length, and uses things present in his exhortations; as when he is discoursing about virginity. For having said nothing about the heavens there, for the time he urges it by things present, saying, "Because of the present distress," and, "But I spare you," and, "I would have you without carefulness." Thus accordingly Christ also with the things spiritual hath mingled the sensible. For whereas the meek man is thought to lose all his own, He promises the contrary, saying, 91 "Nay, but this is he who possesses his goods in safety, namely, he who is not rash, nor boastful: while that sort of man shall often lose his patrimony, and his very life." And besides, since in the Old Testament the prophet used to say continually, "The meek shall inherit the earth;" He thus weaves into His discourse the words to which they were accustomed, so as not everywhere to speak a strange language. And this He saith, not as limiting the rewards to things present, but as joining with these the other sort of gifts also. For neither in speaking of any spiritual thing doth He exclude such as are in the present life; nor again in promising such as are in our life, doth He limit his promise to that kind. For He saith, "Seek ye the kingdom of God, and all these things shall be added unto you. "[And again: "Whosoever hath left houses or brethren, shall receive an hundred fold in this world, and in the future shall inherit everlasting life." 6. "Blessed are they which do hunger and thirst after righteousness." What sort of righteousness? He means either the whole of virtue, or that particular virtue which is opposed to covetousness. For since He is about to give commandment concerning mercy, to show how we must show mercy, as, for instance, not of rapine or covetousness, He blesses them that lay hold of righteousness. And see with what exceeding force He puts it. For He said not, "Blessed are they which keep fast by righteousness," but, "Blessed are they which do hunger and thirst after righteousness:" that not merely anyhow, but with all desire we may pursue it. For since this is the most peculiar property of covetousness, and we are not so enamored of meat and drink, as of gaining, and compassing ourselves with more and more, He bade us to transfer this desire to a new object, freedom from covetousness. Then He appoints the prize, again from things sensible; saying, "for they shall be filled." Thus, because it is thought that the rich are commonly made such by covetousness, "Nay," saith He, "it is just contrary: for it is righteousness that doeth this. Wherefore, so long as thou doest righteously, fear not poverty, nor tremble at hunger. For the extortioners, they are the very persons who lose all, even as he certainly who is in love with righteousness, possesses himself the goods of all men in safety." But if they who covet not other men's goods enjoy so great abundance, much more they who give up their own. Here He seems to me to speak not of those only who show mercy in giving of money, but those likewise who are merciful in their actions. For the way of showing mercy is manifold, and this commandment is broad. What then is the reward thereof? "For they shall obtain mercy." And it seems indeed to be a sort of equal recompence, but it is a far greater thing than the act of goodness. For whereas they themselves show mercy as men, they obtain mercy from the God of all; and it is not the same thing, man's mercy, and God's; but as wide as is the interval between wickedness and goodness, so far is the one of these removed from the other. Behold again the reward is spiritual. Now He here calls "pure," either those who have attained unto all virtue, and are not conscious to themselves of any evil; or those who live in temperance. For there is nothing which we need so much in order to see God, as this last virtue. Wherefore Paul also said, "Follow peace with all men, and holiness, without which no man shall see the Lord." He is here speaking of such sight as it is possible for man to have. For because there are many who show mercy, and who commit no rapine, nor are covetous, who yet are guilty of fornication and uncleanness; to signify that the former alone suffices not, He hath added this, much in the same sense as Paul, writing to the Corinthians, bore witness of the Macedonians, that they were rich not only in almsgiving, but also in all other virtue. For having spoken of the noble spirit they had shown in regard of their goods, he saith, "They gave also their own selves to the Lord, and to us." 7. "Blessed are the peace-makers." Here He not only takes away altogether our own strife and hatred amongst ourselves, but He requires besides this something more, namely, that we should set at one again others, who are at strife. And again, the reward which He annexes is spiritual. Of what kind then is it. "For they shall be called the children of God." Yea, for this became the work of the Only Begotten, to unite the divided, and to reconcile the alienated. "Blessed are they which are persecuted for righteousness' sake." That is, for virtue's sake, for succor given to others, and for godliness: it being ever His wont to call by the name of "righteousness" the whole practical wisdom of the soul. "Blessed are ye, when men shall revile you and persecute you, and say all manner of evil against you falsely, for my sake. Rejoice, and be exceeding glad." As if He said, "Though they should call you sorcerers, deceivers, pestilent persons, or whatever else, blessed are ye:" so He speaks. What could be newer than these injunctions? wherein the very things which all others avoid, these He declares to be desirable; I mean, being poor, mourning, persecution, evil report. But yet He both affirmed this, and convinced not two, nor ten, nor twenty, nor an hundred, nor a thousand men, but the whole world. And hearing things so grievous and galling, so contrary to the accustomed ways of men, the multitudes "were astonished." So great was the power of Him who spake. However, lest thou shouldest think that the mere fact of being evil spoken of makes men blessed, He hath set two limitations; when it is for His sake, and when the things that are said are false: for without these, he who is evil spoken of, so far from being blessed, is miserable. Then see the prize again: "Because your reward is great in heaven." But thou, though thou hear not of a kingdom given in each one of the blessings, be not discouraged. For although He give different names to the rewards, yet He brings all into His kingdom. Thus, both when He saith, "they that mourn shall be comforted;" and, "they that show mercy shall obtain mercy;" and, "the pure in heart shall see God;" and, the peacemakers "shall be called the children of God;" nothing else but the Kingdom doth He shadow out by all these sayings. For such as enjoy these, shall surely attain unto that. Think not therefore that this reward is for the poor in spirit only, but for those also who hunger after righteousness, for the meek, and for all the rest without exception. Since on this account He hath set His blessing on them all, that thou mightest not look for anything sensible: for that man cannot be blessed, who is crowned with such things as come to an end with this present life, and hurry by quicker than a shadow. 8. But when He had said, "your reward is great," he added also another consolation, saying, "For so persecuted they the prophets which were before you." Thus, since that first, the promise of the Kingdom, was yet to come, and all in expectation, He affords them comfort from this world; from their fellowship with those who before them had been ill-treated. For "think not," saith He, "that for something inconsistent in your sayings and enactments ye suffer these things: or, as being teachers of evil doctrines, ye are to be persecuted by them; the plots and dangers proceed not of any wickedness in your sayings, but of the malice of those who hear you. Wherefore neither are they any blame to you who suffer wrong, but to them who do the wrong. And to the truth of these things all preceding time bears witness. For against the prophets they did not even bring any charge of transgressing the law, and of sentiments of impiety, that they stoned some, chased away others, encompassed others with innumerable afflictions. Wherefore let not this trouble you, for of the very same mind they do all that is done now." Seest thou how He raised up their spirits, by placing them near to the company of Moses and Elias? Thus also Paul writing to the Thessalonians, saith, "For ye became followers of the Churches of God, which are in Judea; for ye also have suffered the same things of your own fellow-countrymen, even as they have of the Jews: who both killed the Lord Jesus, and their own prophets, and have driven us out; and they please not God, and are contrary to all men." Which same point here also Christ hath established. 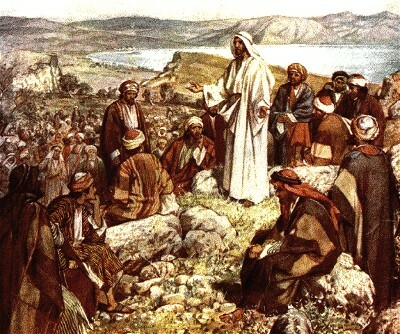 And whereas in the other beatitudes, He said, "Blessed are the poor," and "the merciful;" here He hath not put it generally, but addresses His speech unto themselves, saying, "Blessed are ye, when they shall revile you, and persecute you, and say every evil word:" signifying that this is an especial privilege of theirs; and that beyond all others, teachers have this for their own. At the same time He here also covertly signifies His own dignity, and His equality in honor with Him who begat Him. For "as they on the Father's account," saith He, "so shall ye also for me suffer these things." But when He saith, "the prophets which were before you," He implies that they were also by this time become prophets. Next, declaring that this above all profits them, and makes them glorious, He did not say, "they will calumniate and persecute you, but I will prevent it." For not in their escaping evil report, but in their noble endurance thereof, and in refuting them by their actions, He will have their safety stand: this being a much greater thing than the other; even as to be struck and not hurt, is much greater than escaping the blow. 9. Now in this place He saith, "Your reward is great in heaven." But Luke reports Him to have spoken this, both earnestly, and with more entire consolation; for He not only, as you know, pronounces them blessed, who are evil spoken of for God's sake, but declares them likewise wretched, who are well spoken of by all men. For, "Woe unto you," saith He, "when all men shall speak well of you." And yet the apostles were well spoken of, but not by all men. Wherefore He said not, "Woe unto you, when men shall speak well of you," but, "when all men" shall do so: for it is not even possible that those who live in the practice of virtue should be well spoken of by all men.